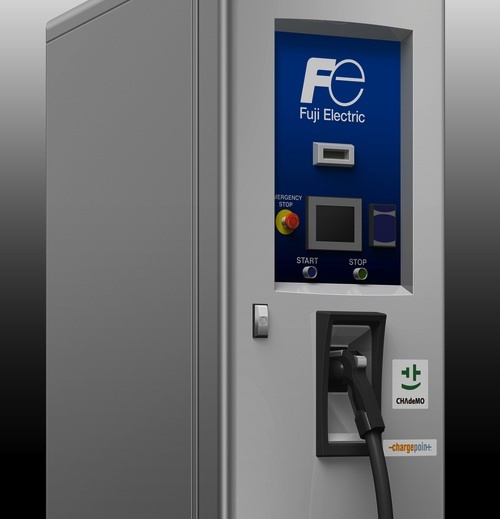 On Thursday, Fuji Electric announced the latest version of their UL Listed 25 kilowatt DC Quick Charging Station for electric vehicles. It is the fourth generation of this CHAdeMO compatible charging station, and is sleeker and slimmer than predecessor units, allowing for more flexibility in site location. The 25 kilowatt charge rate makes it less susceptible to incurring demand charges from utility companies than higher power charging stations. The CHAdeMO standard was developed in Japan several years ago and is widely used in that country. It supports a quick recharging experience for electric car owners, and studies of Japanese electric car owners have shown that when the CHAdeMO charging network became operational electric car utilization went way up. This style of fast charging utilizes a high power DC current between charging station and car, and requires a large external box to hold the power electronics. Normal J1772 charging stations use a much lower power AC current, and the conversion to DC is done on-board the electric car. The new version integrates support for the ChargePoint protocol. This will allow charging station operators on ChargePoint to deploy fast charging stations for their customers' use. Because the Fuji station is lower power than other CHAdeMO charging stations, a recharge session will take a few minutes longer. However this design offers several advantages to charging station operators that may result in wider deployment. The unit costs less both to purchase and to install, and will incur fewer demand charges making it less expensive for the charging station operator to run. Electric cars supporting CHAdeMO are the Nissan Leaf and Mitsubishi i-MiEV. While there are a large number of these on the road, the automobile industry, via the SAE J1772 committee, have chosen a different standard for DC Fast Charging. The SAE DC Fast Charging standard is not yet available in any production electric car, with the Chevy Spark EV slated to be the first electric car to support SAE DC Fast Charging. Fuji Electric says they are working on SAE DC Fast Charging support, for the future as such cars become available.